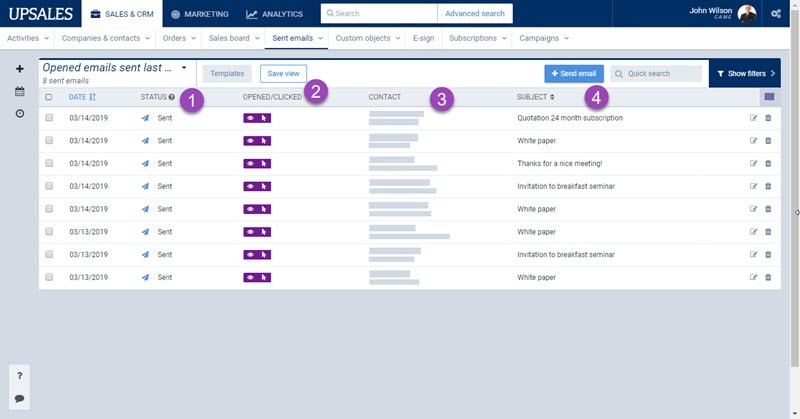 The Sent Emails list helps you track individual (one-to-one) emails sent to contacts through Upsales. Your admin will need to verify and connect your email domain before you can send emails through Upsales. The Sent Emails list includes emails that you have sent through Upsales. Select the arrow next to Sent emails. The list you selected is displayed. The Sent Emails list provides an overview of information about emails you have sent through Upsales. To find a specific email in the list, enter the first few letters of the Contact or Company name or the Subject in the Quick Search field at the top right. 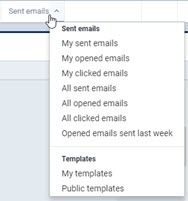 The row for each email allows you to open, edit or delete the email.